Till few years back almost the same screen resolution was used uniformly in all computers. But with the introduction of different types of devices of surfing internet in recent times like PC, laptop, smartphone or tablets screen resolutions have been changing continuously as screen sizes in these devices vary widely. A web designer has to keep this fact in mind while designing the website. As a businessman you will always want that visually your website must look attractive in addition to being informative so that your prospective customers are easily impressed. Previously the most common resolution was 800×600. Later as screen sizes got bigger the normal screen size became 1024×768. Now as sizes of monitors are growing bigger screen sizes are also changing and hence the web designer has got an additional task in his hand to test how his design will appear in different screen resolutions. ResizeMyBrowser : There are some pre-defined resolutions in ResizeMyBrowser which fix your browser window to those resolutions. These resolutions are of laptop, tablets or smartphone. Also if you want a size of your own then you can define a new preset resolution. You can also delete the same if you so wish. Screenfly : With the help of this tool you can view your website in different sizes of screens and resolutions. Just you enter the URL of the website and press “GO” to start it. Screenfly gives you options to view your website in Desktop, Mobile, Tablet or Television screens. ViewLike.us : This is another online tool which helps you in testing your website in different resolution formats. One just needs to type the URL of the website in the box provided and press the “Check up” button. The design then can easily be checked in different screen formats. This supports nine screen resolutions including 800×600, 1024×600, 1024×768, 1152×864, 1280×800, 1400×900, 1600×1200, and 1920×1200. The only drawback that this suffers from is that you cannot customize. Testsize : Testsize.com is another easy-to-use tool to view your website in different screen sizes and resolutions. One has to simply enter the URL of the website, select a screen size from the drop-down list or enter the desired screen size and hit the Open Popup button. The selected screen size will be displayed in a new pop up window. Firesizer : With the Firesizer Firefox add-on you can test your website in different screen sizes by re-sizing your browser window. It has an added status bar. At the bottom right corner the current window size is shown. You can add your own dimensions also. Yet Another Window Resizer : As the name suggests you can resize your window with this. It is very easy to use. You can select your screen size by right clicking anywhere on the web page. Resolution Test : Installing the extension to the browser you click on the test icon on the top right corner and select single or multiple resolutions. You can also define your desired screen size. Window Resizer : This is almost similar to the Resolution Test. 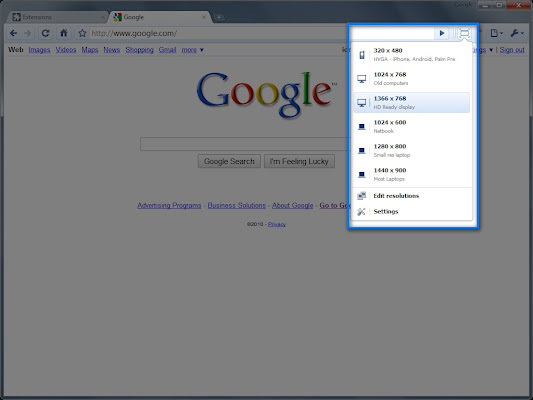 You can re-size the browser window from some pre-defined window sizes or your own desired size.